Soap Factory Gallery: Info on "Landmark"
Minneapolis was built on industry. Flour mills, shipping, and the railroad all played a part in the city's history. 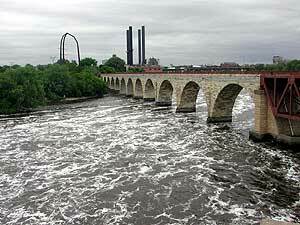 If you were to point to one single place that embodied that history, you'd probably end up at the Stone Arch Bridge. The bridge allowed trains to cross the Mississippi River while permitting barges to pass underneath. A group of artists has joined together to draw people's attention back to this downtown Minneapolis landmark. In fact, that's what they're calling this performance: "Landmark." Minneapolis, Minn. — Just a few blocks away from the Stone Arch Bridge, the Soap Factory Gallery is buzzing with activity. Musicians rehearse, artists assemble guide maps and paint oversized puzzle pieces with sky and clouds. Outside, carpenters build wooden chairs. They're doing all of this for just one performance. But co-organizer Krista Walsh says this is not a typical show. "Unlike a performance where you go sit in seats, and it has a beginning a middle and an end and you know what you're supposed to do and think, this is more like you're stepping into a solar system," says Walsh. "There are things happening all around you, spinning all around you on their own trajectories, and your only job as a viewer is to pay attention." "Landmark" will run for 24 hours straight, on and around the Stone Arch Bridge. A miniature train will run back and forth while workers sweep and carry stones. Musicians will improvise music evoking the river and the bridge's history. Dozens of performers will combine dance, music, and theater. Walsh is one of six organizers. Together they call themselves Local Strategy. "Landmark" is their first project. Walsh says they were drawn to the Stone Arch Bridge because it's vital to the history of Minneapolis, and also because people's relationships to it have changed over time. "It's lived through so many lives and watched so many things happen. it's the one consistent thing -- the place," says Walsh. "Everything that has churned through it -- we're trying to bring that back into play for a day." The Stone Arch Bridge was built in the early 1880s by entrepreneur James J. Hill, to connect his railways on either side of the river. The bridge served that purpose for almost a century. It lay abandoned for more than 15 years, until it was converted in 1994 into a public walkway and bike trail. Walsh says Local Strategy decided to create a 24-hour performance because when the bridge was first built, workers labored day and night for almost a year to complete it on schedule. "There's something that is reflective about committing to this space for 24 hours, and doing an action that mimics that ever-continuing effort," says Walsh. "And the presence of the sun, the river, the presence of human lives, it's all continuous and enduring." Heidi Prenevost is the program administrator at the Soap Factory and is also a "Landmark" performer. While she's scheduled to perform for only six hours, she plans to stay up for the entire 24. "In school I only slept for about two minutes in the entire four years, so I don't think it will be a problem at all," Prenevost laughs. Prenevost will lead other volunteer performers in simple choreographed movements appropriate to the place, such as wading in the river and staring at the sky. She says the project has helped her see the Stone Arch Bridge in a new way. "When I bike around the city, I definitely will take the Stone Arch Bridge now no matter where I go, because I almost feel like it's mine now instead of just a tool," says Prenevost. "Landmark" organizer Krista Walsh says that's the goal, to give people a new perspective. "Which I think is one of the most beautiful things about art, that it informs us to look in a new kind of way. It's what artists do all the time. They see the world through that vision that they're carrying in their heads," says Walsh. "So to me, when I walk through the world, everything is an art event. Ultimately, if a person has a positive experience here, maybe they'll see a little of that in their world in their daily life." The 24-hour "Landmark" performance begins at sunrise Saturday at the Stone Arch Bridge. People who show up at the bridge will be able to simply walk across and observe the performance, or even sign up and become a part of it.